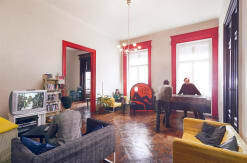 Pal's hostel is not a regular hostel, but a chain of apartments in the center of Budapest around the St. Stephen's Basilica. 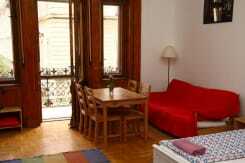 If you favour privacy and want to stay at a place that feels just like home, come to Pal's Hostel Budapest. 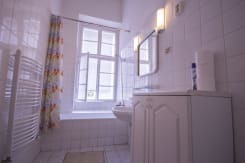 Enjoying the privacy of your own apartment doesn't mean you have to miss our personal attention. 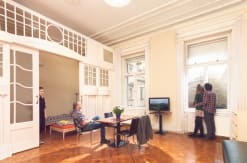 Our reception desk is next to St. Stephen's Square and our staff will be glad to help you planning your stay, giving information and an individual view on Budapest. We offer airport pick up and drop off (for 24 EUR for up to 4 persons: this means 6 EUR per person, while public transport is about 3 EUR per person). 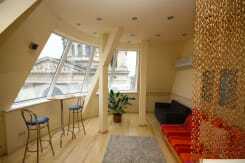 The hostel is in the very downtown of Budapest, within walking distance of the "Soho of Budapest' - Opera House, plenty of theatres and music clubs and a wide-ranging choice of restaurants, cafes and pubs. 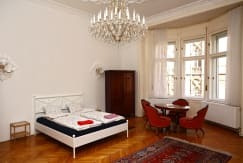 Traditional sight-seeing spots like Heroe's Square or Buda Castle are also within easy reach and the Danube is only 5 minutes by foot. 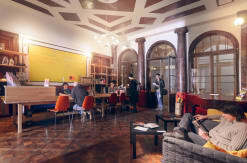 Our reception desk opens from 9 am to 2 am, but you can only check-in after 2 pm. If you arrive before 2pm we can hold your luggage free of charge and you can wait in our lobby. We'll contact you for detailed information of your arrival to estimate your check-in time. Our reception desk is open from 9 am to 2 am every day. If you arrive later than that we will come back to let you in. We will contact you for detailed information about your arrival - such as train or flight details - a few days before your arrival. Please note that we aren't able to accept credit card payments so your remaining balance should be paid in cash. 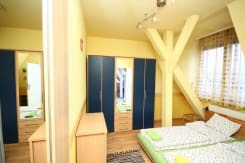 Please also note, for large groups exceeding more than 15 people/4 rooms, Pal's Hostel reserves the right to cancel your booking at any time. In our confirmation letter you can find a google map how to walk to the hostel from the biggest underground junction called 'Deak Ferenc ter'. From the airport terminals: bus number 100E to the terminus 'Deák Ferenc tér' (3rd stop). It takes approx. 50 minutes. You’ll need shuttle bus single ticket (one per person) for the bus ride. Or you can choose our quick and easy airport transfer service (€24). From ‘Keleti’ Railway Station: Metro 2 (red line) to ‘Deak Ferenc ter’ (3rd stop), approx. 20 minutes. From ‘Deli’ Railway Station: Metro 2 (red line) to ‘Deák Ferenc tér’ (4th stop), approx. 20 minutes. From 'Kelenfold' Railway Station: Tram no. 49 to the terminus, 'Deak Ferenc ter' (11th stops, approx 40 minutes. From 'Nepliget' Bus Station: Metro 3 (blue line) to 'Deak Ferenc ter' (6th stop), approx. 30 minutes. The hostel is in the very centre of downtown. 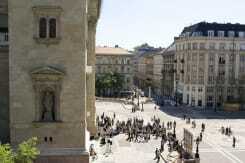 Other important sightseeing spots like Buda Castle, Heroes' Square or the Baths are also very close (20-30 min). 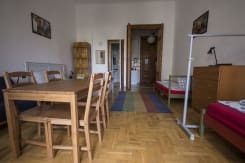 The Danube bank is only five minutes walk away!